At the bottom of the budget bill that the Senate passed last week is an ultimatum concerning the future of Vermont Life magazine. The provision on page 116 — of 118 — requires the administration of Gov. Peter Shumlin to figure out how to remedy the magazine's cumulative deficit, which now totals $2.8 million. Senators want the state-owned quarterly publication to start breaking even in two years, so this liability doesn't keep accruing on the state's books. There's been more red ink than black at Vermont Life in the past three decades — 20 of the past 30 years have ended in deficit. The total amount due has more than doubled since 2013, when the magazine was in the hole for a cumulative $1.3 million. The deficit is real and accelerating, warned Finance Commissioner Andy Pallito, and "will need to be paid back at some point." Sen. Richard Westman (R-Lamoille) proposed the requirement that also calls for the secretaries of administration and commerce to conduct an operational review of the magazine. Westman said the state, with its current financial challenges, is in no position to continue an endeavor that he considers to be of questionable usefulness. "From the committee's point of view, looking at the most recent Vermont Life, the only thing that speaks to Vermont is the name," Westman asserted. If the Agency of Commerce & Community Development, which oversees the magazine, wants to maintain Vermont Life, Westman suggested, it should find a way to absorb the shortfall in its own budget. The state has published Vermont Life since 1946. "When it was first started, making a profit was not a goal," said Lucy Leriche, deputy secretary of commerce and community development. The state subsidized the magazine for some of its 70-year history, she added. As former editor and publisher Tom Slayton summarized it for Seven Days in 2009: "The first 20 years it got a state appropriation, the second 20 years it made money, and the next 20 years it got more complicated." The state created the magazine to promote Vermont to tourists traveling the then-new interstate highway system. Leriche said it continues to have "tremendous value" as a tool to promote the state's so-called brand. "It really promotes farming and food, and it really pulls people's hearts to come here." Because of the legislature's long-standing concern about the magazine's chronic revenue shortfalls, Leriche said the agency has investigated other operational models in recent years. When Lawrence Miller was secretary of the agency between January 2011 and April 2014, "he had conversations with various entities about taking over Vermont Life," Leriche said. "It became clear we weren't going to be able to get any money." To the contrary, she said, the state might have to pay someone to take it. Last summer, Leriche said she called a magazine broker to discuss options, including ceasing publication. Considering the possibilities, she said, "The thing that stopped us dead in our tracks is the moment we move the magazine out of state government, the accumulated deficit becomes due." The state's Comprehensive Annual Financial Report accounts for it as a $2.8 million debt in the magazine's "enterprise" fund. More importantly, she said, "What we realized is, we really value the magazine, and we don't think it is in Vermont's best interest to hand over this investment to another entity that may not have Vermont's interest at heart." Mary Hegarty Nowlan chafes at the notion that an annual balance sheet should measure Vermont Life's worth. She's been expressing as much since she took over as editor eight years ago, when the magazine was $200,000 in the hole. Last week she insisted: "It's time to change the narrative." Nowlan argued that Vermont Life prompts readers — two-thirds of whom reside outside the state — to spend millions of dollars on dining, lodging, even second homes in Vermont. She said that Ken Jones, economic research analyst at the Agency of Commerce, calculated that the magazine generates $33 million of in-state economic activity every year — not including property purchases. To support her view of Vermont Life's economic impact, Nowlan cited data from a reader survey that the magazine conducted a year ago. When asked if they took any action as a result of reading Vermont Life, 44 percent of the 770 respondents said they planned a vacation, 56 percent said they tried a new restaurant, 26 percent made lodging plans, and 67 percent bought a Vermont product, visited a Vermont store or used a Vermont service. Six percent said they bought real estate in Vermont. Vermont Life staff provided Seven Days with a sampling of reader comments. "We would always look in Vermont Life to plan our trips and of course, shop! Wouldn't vacation without it," one reader wrote. Another wrote, "My wife and I are Vermont transplants and Vermont Life is one of the ways we explore the state and find new and interesting things to do and places to visit." Nowlan also said Vermont Life is helpful in recruiting workers to the state. Vaughn Collins, executive director of the Vermont State Dental Society, confirmed that his organization uses the magazine to attract practitioners. The society always has a stack of Vermont Life magazines displayed at its booth at the annual Yankee Dental Congress in Boston, Collins said. "It is a really great marketing tool to sell Vermont." Nowlan blamed the loss on reduced advertising revenue, a falloff in calendar purchases — which in the 1960s kept the operation in the black — and higher costs for employee benefits. She offered some of the same reasons for revenue shortfalls in 2009 and 2013. Sen. Kevin Mullin (R-Rutland), who chairs the Senate's economic development committee, noted that in recent years the magazine "hadn't even sent an advertising person to Stowe," one of the state's premier tourist destinations. Nowlan acknowledged that the people most recently selling advertising for the magazine "didn't really have the drive to get out there." Back in 2013, Dave Hakins, working as advertising director and publisher, had a plan to achieve a balanced budget by 2015. Then he was diagnosed with cancer, Nowlan said. "It was heartbreaking to me on a personal and professional level. He increased advertising tremendously in his short tenure." After Hakins' death that same year, the magazine relied on freelancers to sell advertising for two and a half years until three weeks ago, when Chris McGee, former owner of TravelHost magazine, became Vermont Life's new advertising sales director. "He will be the sole person in the field knocking on doors," Nowlan said. "We are going to be setting sales targets for him." She cited several initiatives that have reduced expenses. "We have half the staff from when I came," she said. There are eight employees today. She also trimmed printing and shipping costs, eliminated the catalog of works by local artisans, shrank the catalog of calendars and note cards, and even stopped listing the magazine in the telephone book. To generate more money, the magazine has offered services to other state agencies, Nowlan said. For example, Louis Porter, state fish and wildlife commissioner, said his department contracted Vermont Life to design and print its annual fishing law digest, a publication that spells out fishing regulations and provides maps and information about dozens of lakes and streams. "Previously there was a national company that did it for us," Porter said. This year, Vermont Life will receive $45,000 to produce the fishing portion of the book. "We really decided to make the change because it makes sense for state agencies to work together," Porter said. "It keeps the job in the state." He expects that Vermont Life's design expertise "will give us a chance to showcase what the state offers for recreation." Vermont Life also provides photos for the Department of Tourism & Marketing and edited a municipal planning manual for the Department of Housing and Community Development. "The state is getting more bang from Vermont Life staff," Nowlan said. Not long after she took over, Nowlan began retooling the design and editorial content of the magazine. In response, the magazine's advisory board complained that she was moving too fast with changes so bold that she risked alienating loyal subscribers. Westman and Mullin have similar concerns: that the magazine no longer portrays iconic Vermont. Nowlan, who has a master's in magazine publishing and worked as a senior editor at EatingWell, makes no apologies for bringing a new vision to the magazine: "I have taken it from a magazine that was very historically focused to one looking at what is going on today." Nowlan said her vision is for a magazine that is valuable and interesting to in-state readers as well as the traditional out-of-state market. In a radio ad that aired on the Point in 2013, Nowlan described the magazine as being "by Vermonters, for Vermonters, about Vermonters," adding, "It doesn't get any more local than this." That approach may account for a slight improvement in subscription rates. After 20 years of declining circulation from an all-time high of 105,000 subscribers, the number of Vermont Life subscribers grew 13 percent over the past two years — from 30,884 to 35,159. Similarly, reader demographics are trending in the right direction. Six years ago, the average Vermont Life reader was 68. Today he or she is 55. Nowlan herself is 48. The magazine still features a gallery of trademark seasonal photographs, and Nowlan looks for stories that represent what she considers the four pillars of the state's "brand": food, outdoor recreation, arts and entrepreneurship. "These are the things that set us apart and are strong points to get people to come here," she said. In an editor's note about the stories in the upcoming summer issue, she laid out her view that Vermont in 2016 has many different faces. It's "raucous Thunder Road adrenaline junkies and tranquility-seeking fly fishermen, young refugees from Somalia and farmers who live their entire lives on the hillsides of Vermont. Vermont is progressing, yet steady, ambitious, yet serene." "I really feel Vermont is poised right now to capture the imagination of a new generation," said Nowlan. The role of Vermont Life is to reflect the diversity and new developments and catch fire with a new generation of readers, she said. But the question remains: Can it pay for itself so taxpayers won't have to? Whether the Senate's provision on Vermont Life ends up in the final budget bill has yet to be decided. House Appropriations chair Mitzi Johnson (D-South Hero) said her committee shares the Senate's concern about the magazine's growing deficit. "We want to make sure it moves to some form of sustainability." Regardless of what the legislature does, Leriche promised, "We are going to just keep trying to work through this problem. There could be things we have not explored." Nowlan predicted that "no matter how much cutting and increased sales we do, Vermont Life will still need the state to set aside an appropriation to cover the shortfall." She said it's time to change the thinking about the magazine. It's an investment, not an expense, she said, one "that produces a tremendous return ... for Vermont." 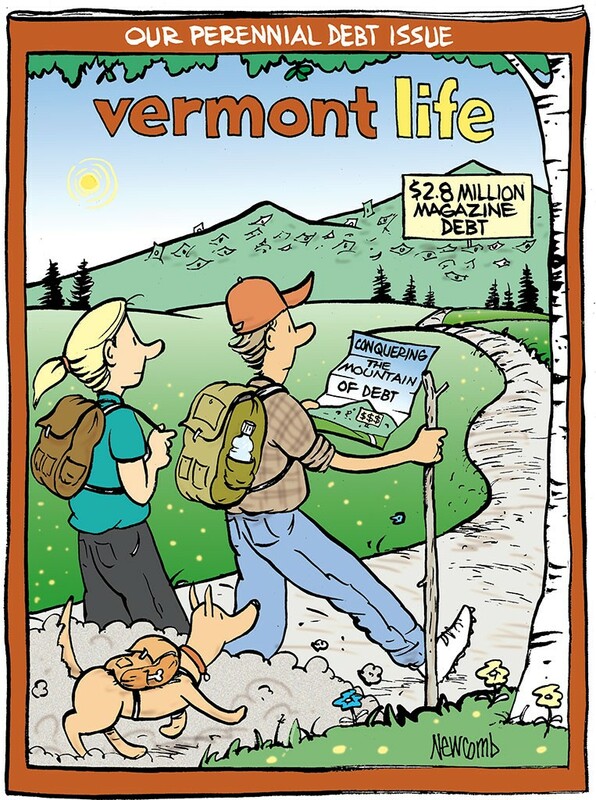 Can Vermont Life Magazine Dig Out From a Mountain of Debt?